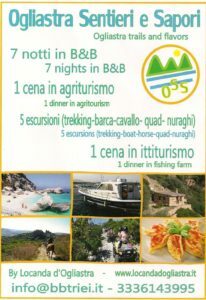 7 notti in B&B / 7 nights accomodation in B&B. 1 escursione alla splendida Cala Goloritzè / 1 excursion to the wonderful Cala Goloritzè. 1 escursione serale con visita ai siti nuragici, camminata di 3 km fino ad un rifugio in collina dove verrà servito un arrosto di capra e maialetto. Ritorno sotto le stelle / 1 Evening excursion to places of prehistorical interest, nuraghi, 3 km walk to a shelter on the hill where roast meat (porc and goat) will be served. Walk back to the B&B by starlight. 1 escursione a cavallo / 1 excursion by horse around Triei hills. 1 escursione in barca alle famose cale del golfo di Orosei / 1 excursion to explorer the wonders little beaches of the famous Orosei gulf by boat. 1 escursione in quad / 1 excursion by quad bike on the mountain. 1 cena in agriturismo / 1 dinner in a farm. 1 cena in ittiturismo / 1 dinner in a fish farming. 1 degustazione in cantina / 1 wine tasting in winery where you can sip and taste wines and local cheese and cold cuts.